The Model OX 7102-C is the perfect tool for both laboratory and field testing. Ease-of-use of the instrument is facilitated through 33 specialized keys for direct access to commonly used functions. 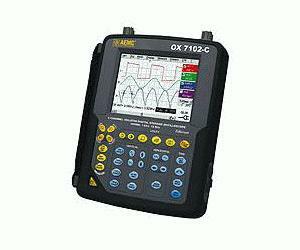 Ideal for field use, the Model OX 7102-C utilizes the patented new system of plug-and-play accessories, individual isolation of each of the measurement channels, a range of remote management capabilities based on an Ethernet link with web server, a number of built-in instruments, including a four channel TRMS multimeter. The large 320 x 240 full color LCD screen provides detailed graphical and alphanumerical representations of all measurements and also functions as a touch screen. Using the convenient stylus, the various Windows-like menus can be opened or pulled down and executed. The stylus can also be used for direct action on graphic elements such as cursors, triggers, and zooming.